Houston Criminal Lawyers at James Sullivan and Associates have been trying criminal and juvenile cases to juries since 1994. From a lifetime of difficult experiences, trials and tribulations, Houston Criminal Lawyer James Sullivan draws upon wisdom in his closing argument to the jury. He has won cases at trial in many different criminal and juvenile cases including aggravated robbery, aggravated assault, negligent homicide, aggravated sexual assault of a child and burglary of a habitation. Approximately two-thirds of his cases at trial are either dismissed outright or reduced from a felony to a misdemeanor. 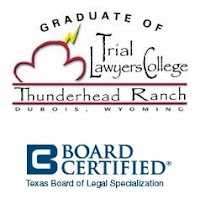 In addition to the training he received as a trial lawyer at South Texas College of Law, Houston Criminal Lawyer James Sullivan has also received advanced training with the best trial lawyers in the U.S. at the Trial Lawyers College. These highly specialized skills include using role reversal, doubling and scene settings to delve into the heart of the case. With a full understanding of what occurred in the case, James Sullivan persuades the jury with a compelling story. Houston Criminal Attorney James Sullivan is also Board Certified in Juvenile Law by the Texas Board of Legal Specialization. Juvenile Law is different than criminal law. He is among the select few with such a specialty. Of the 83,596 active attorneys in the state of Texas, there are only 38 lawyers in private practice with a juvenile law specialization. If you need a Houston Criminal Lawyer to defend you, call James Sullivan at (281) 546-6428.